Having eaten very little for the late breakfast and light lunch, we were hoping to have a substantial dinner last night. Unfortunately, when we asked around for recommendations, we discovered that we were in the middle of an area where there were dozens of neighborhood bars with pintxos but the closest restaurant serving menu deal dia was a kilometre back in the center of town. We were not going there so for the third meal of the day, we ate pintxos, albeit several plates of different delicious morsels. It just wasn’t enough though so the poor nutrition affected today’s walk. By the time we had our morning tostada (think a short French loaf, cut lengthwise and toasted) and coffee / juice and after we caught a taxi back to Recajo to start where we left off yesterday, it was a rather late 9:30am start. The first couple of kilometres were a somewhat boring walk along the main road but when we got off that, the rest of the way was either beautiful countryside or lovely vineyards / farmland with a couple of quaint small towns thrown in for good measure. 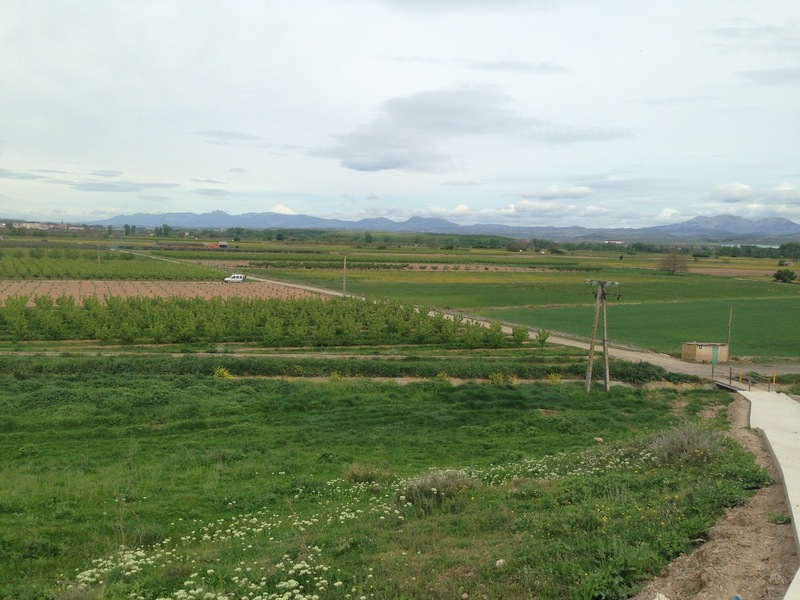 It was fairly flat throughout and always between the Ebro River and railroad tracks. 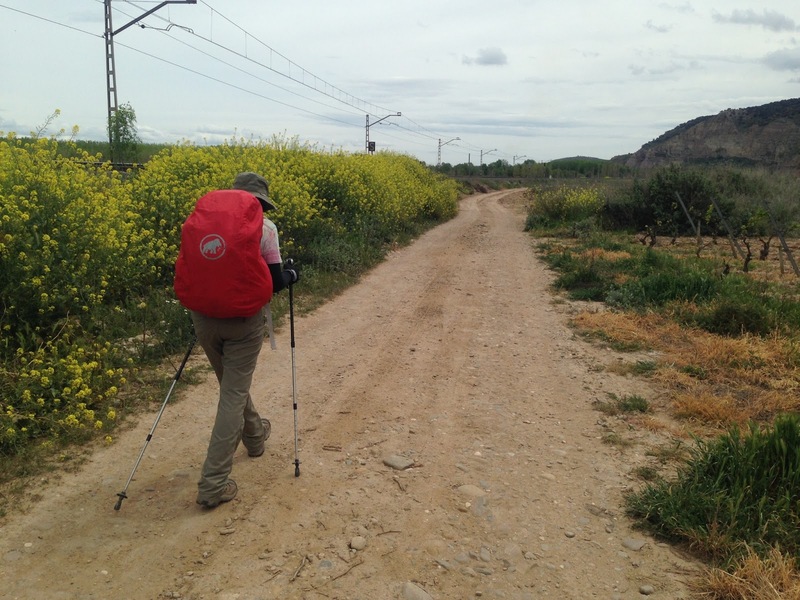 For many kilometres, the Camino Ignaciana is the Camino del Ebro in reverse. At the first town we reached today, Agoncillo, we stopped for a small finger sandwich and juice. Who knew when we would get real food again? The bar where we stopped had several regulars hanging around already, all curious about what we are doing and where we are going. Few people in Spain know this route but everyone knows the Camino de Santiago. These guys just thought we were a little looney for walking so early in the day, when the bar is open and serving cold beer. 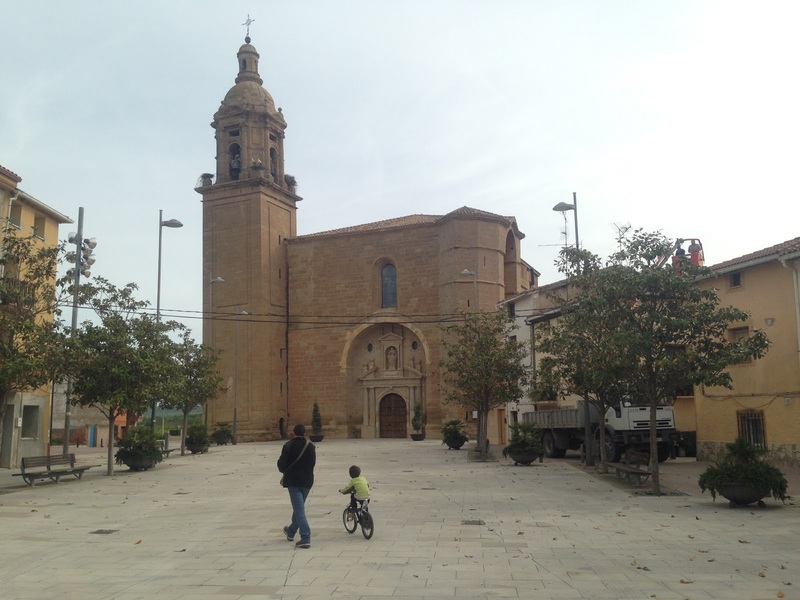 The town also has a zillion year old castle (Castillo de Aguas Mansas) and a nice old church. The bell tower of the church seems to be leaning, away from the church, possibly due to the weight of the stork nests on top. The church in Agoncillo, with its leaning bell tower. There is a distinct crevice between the church and tower. 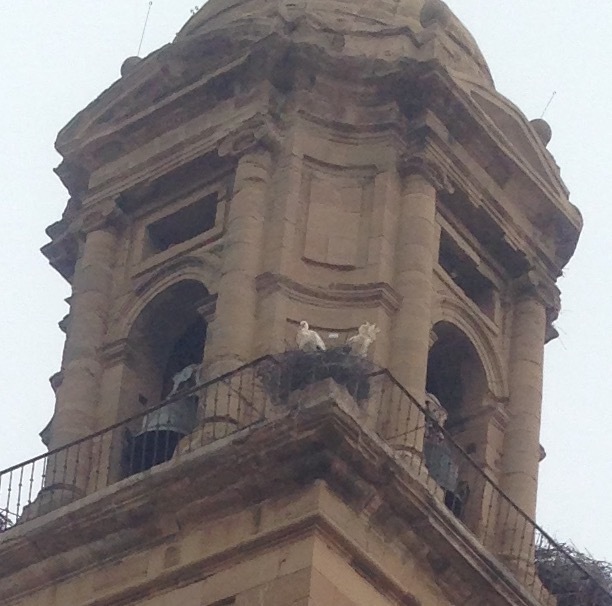 There were baby storks in the nests on the bell tower! Arrubal was the next town we arrived at. You have to climb a small hill to get to it and the climb passes several hobbit homes, built into the hillside with only their entrance doors visible. Melanie seems to think that they are storage places for wine and mushrooms but I know a hobbit house when I see one. Arrubal did not appear to have any places for food open so we just continued through and hoped. Unfortunately, that was the last place available for food until we got to Alcanadre. It worried us a little as we passed some famously high cliffs with vultures circling above us. Were they looking at us? Another bird we often hear, rather than see, is the cuckoo bird. It’s either that or someone’s clock striking 248 o’clock. By the time we got to Alcanadre, we were very ready to stop walking, clean up and eat. We had been warned that the town only had a small albergue, stuck at the bottom edge of town above the railway station. We were not sure if the town had a restaurant but we knew there was at least one bar as they held the keys for the albergue if the albergue wasn’t open. When we got to the station, it looked so desolate from the outside that we chanced walking up the steep hill into town. It didn’t look promising at first but we just kept climbing. Finally, we saw a bar (Garabatas bar and disco!!!). It not only looked crowded but it wasn’t even the Union Bar we knew of. A good start! 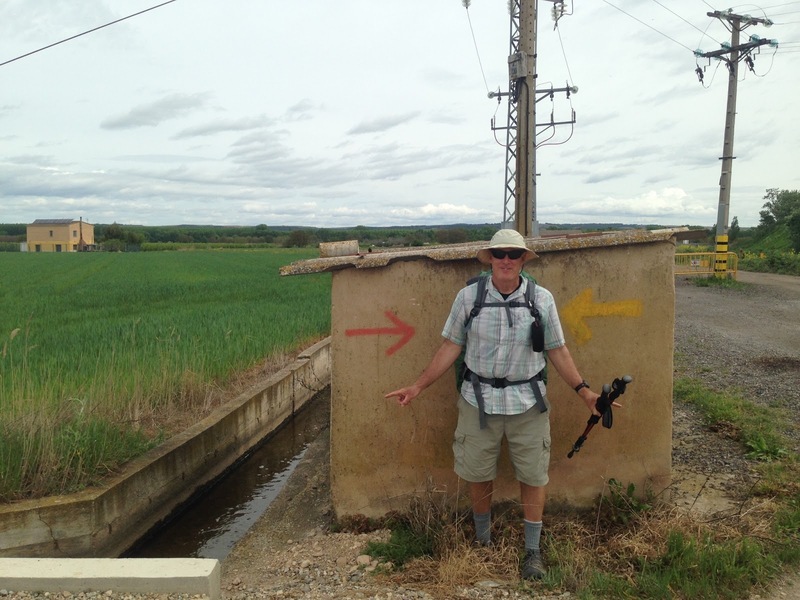 Even though we were near the Ebro the whole day, our first view was only half way through the walk. A last look back at what we have referred to as “our mountains”. The Basque people may, however, have prior claims. From this angle, I can no longer pick out the last peak we rounded as we left the range but they will always be “ours”. Inside the bar, we asked if there were any casa rurals or pensions in town and we were surprised and happy to hear there were two. We decided to head 100m east to check out the casa amarillo (no signboard casa rural – attached to the Las Brasas de Baco restaurant – a real restaurant with fancy food!!!!). Sadly they were full for the weekend. We headed back to Garabatas and then 100m north the Casa Azul. Sadly that building seemed closed. We then found the Union Bar on the next street and asked for the keys to the albergue. While trying to speak with the bar man, we asked if there were any other places to sleep. We complained that the other places were not available and he looked confused. He handed us a business card for the Casa Azul and walked away. That helped as I didn’t already have that number so I started to dial, hoping that the owner could open the place for us. Just then, the bar man’s phone rang – it was me!! It turned out that he was letting out the rooms in Casa Azul and he didn’t mean for me to call anyone. I wish my Spanish was better but we all would have missed a good laugh. Note to those following us: we are smack dab in the middle of a bar epidemic. In this tiny town, we can see five bars and a restaurant from the steps of the Garabatas. There are two casa rurals too, contrary to what they say in the guide. The yellow house (Lagos de San Isidiro, (667 710 691) looks extremely nice from the outside and has the restaurant next door. The blue house (Casa Azul, 686 730 187) looks iffy from the outside but is very nice inside. The train station albergue looks like hades on the edge of hell. Actually, it may not be bad at all but it seems too far to roll to get home from dinner or any of the bars. During my reflection time, I thought about something that my alma mata, Loyola University of Maryland, always tried to teach us. 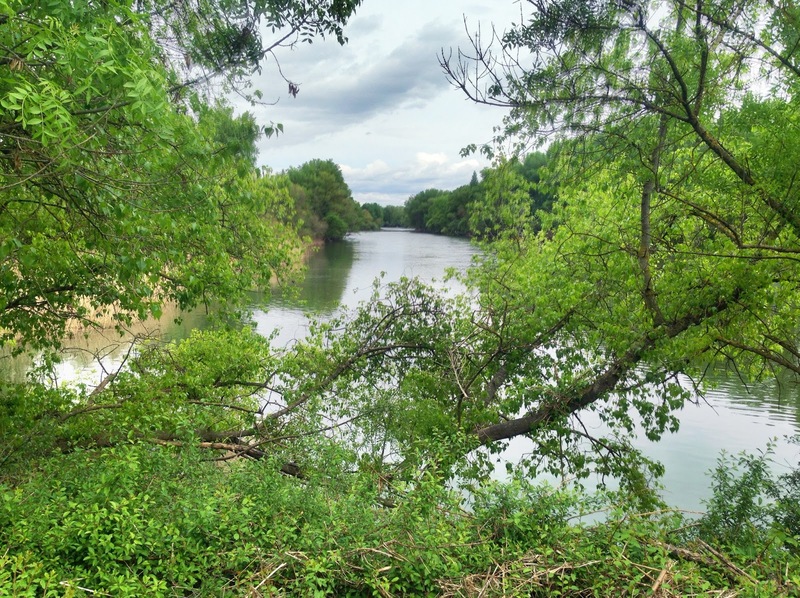 As Jesuits, they drilled into us that we should see God in everything. In the Basque country, it was easy to see God’s work in the beauty of the mountains, trees, flowers and people. Along the walk today, I realised that I will have to look much harder over the next few weeks. I’m sure his work has been done here too but I think he spent more time in the Basque region. Now the real work begins, finding peace not loneliness in the solitude. Crunch…crunch….crunch… the road ahead awaits.